"You Can't Make Old Friends," Dolly's new duet with Kenny Rogers, sees its music video inch down one spot to No. 5 on the Great American Country Top 20 Country Countdown this week. Vote for it in next week's charts on GAC here and CMT here. Overseas, the three-disc compilation The Real Dolly Parton loses another 18 places to No. 69 in its seventh week on the Irish pop albums chart. I understand that all $700 orchestra-level meet-and-greets for Dolly's May 27 charity concert in Richmond, Ky., sold out on Thursday, although there is a waiting list in case some purchasers don't make payment on their orders by Wednesday. In addition, all boxes with meet-and-greets are sold out, leaving only $1,500 front row meet-and-greet seats remaining. Organizers say this is the fastest-selling show in the event's 10-year history. General tickets remain available without meet-and-greets in the orchestra level and second and third tiers. More information is on the St. Mark Catholic Church website here. Dolly's "Hard Candy Christmas" falls back off the 50-position holiday digital songs chart this week, down from No. 44 in its fifth week this year and 23rd week since release, the Dec. 7 Billboard numbers revealed Thursday. Her and Kenny Rogers's Once Upon A Christmas inches up one to No. 6 country catalog albums in its 87th chart week and its fourth this year, gains five to No. 37 pop catalog albums in its third week this year and 19th week since release and rises 23 spots to No. 165 on the top 200 pop albums chart in its second week this year and its 23rd week since release. Willie Nelson's To All The Girls, with a new Dolly duet, dips one to No. 20 country, 30 to No. 133 pop, and 22 to No. 113 current albums in its sixth week. Kenny Rogers's You Can't Make Old Friends, also featuring a new Dolly duet, moves down five to No. 37 country in its seventh week and falls off the top 200 current albums chart, down from No. 161 in its sixth chart week. The Civil War ballad collection Divided & United, with a Dolly duet with Stuart Duncan, falls off the newly-shortened top 50 country albums chart (it used to be 75 positions), down from No. 32 in its third week. I Will Always Love You: The Best of Whitney Houston, with the late singer's version of Dolly's title song, falls off the R&B/hip-hop albums chart, down from No. 74 in its 53rd week, as that tally also was shortened from 75 positions to 50 this week. Overall, Duck Dynasty's Duck The Halls: A Robertson Family Christmas remains steady at No. 1 country and No. 4 pop in its fourth week, while Luke Bryan's Crash My Party remains at No. 2 country and drops three to No. 15 pop in its 16th week. Dollywood on Wednesday sent out a message from Dolly to members of the park's DreamMore Resort's Founders Club members wishing everyone a wonderful holiday. It read: "I wish everyone a Thanksgiving full of love, warmth and hope. As you celebrate, take time to give thanks for the blessings-big and small-you've received. Most of all, I truly hope you and yours experience the bountiful joy this special holiday brings to each and every heart." An article from Studio System News on Disney's Frozen project recalls briefly Dolly's involvement in an animated film for the studio called My Peoples which ended up not getting made. Read more here. Thanks to Manny for sharing material from last weekend's sold-out drag 9 To 5 parody Workin', which premiered in San Francisco featuring Rupaul's Drag Race alum Pandora Boxx as Dolly before a crowd of 1,400. Manny, who played Mr. Hart, tells me the 60-minute performance (which was followed by a screening of the original film) featured a couple of dance numbers and Pandora dressed in Dolly's "Backwoods Barbie" outfit for the finale of "Lil' Bitty Ole Pissant Country Place." He also said film co-star Lily Tomlin called organizer Peaches Christ just before the show to express her regrets that a conflict kept her from attending and to wish all good luck. Check out pictures here and a YouTube video here or in the media player below. Dolly is returning to the "An Evening Among Friends" fund-raiser for St. Mark Catholic Church in Richmond, Ky., six years after her first appearance headlining the annual charity concert, which once again includes meet-and-greets for sale. The May 27 appearance takes place at the East Kentucky University Center for the Arts. Tickets are available here. Ground floor tickets (Orchestra I and II) are $125 each or $700 each with meet-and-greet, and second and third level tickets (Grand Tier I and II) are $75 each (no meet-and-greets available at that level). Two four-person boxes are available for $1,000 (or $2,000 with two meet-and-greets) while six six-person boxes are available for $1,500 (or $2,500 with two meet-and-greets). The two eight-person boxes were sold out before tickets went on sale to the public (they were announced to the church's congregation on Tuesday). A total of 19 center front row seats are available for $1,000 each or $1,500 with a meet-and-greet. Image from her October 2008 concert fundraiser from "An Evening Among Friends" is � Copyright 2008 T. Duane Gordon/www.dollymania.net. The Kingsport Times News talks about Dollywood's A Christmas Carol with a piece here. The Kenny Rogers and Dolly duet "You Can't Make Old Friends" holds steady at No. 4 on the Great American Country Top 20 Country Countdown Friday. Vote for it in next week's charts on GAC here and CMT here. Overseas, The Real Dolly Parton three-CD set falls eight to No. 51 in its sixth week on the Irish pop albums chart. Down Under, the 2007 compilation The Very Best Of Dolly Parton, Volume 1 inches up one to No. 16 in its 297th week on the top 40 Australian country albums tally while The Essential Dolly Parton also gains one to No. 22 for a 57th chart week. On the British country compilation charts, Emmylou Harris's Original Album Series, Volume 2 (featuring one track with Dolly harmony and two tracks with Trio harmony by Dolly and Linda Ronstadt) moves up one to No. 3 in its 11th week on the chart, and her first Original Album Series, Volume 1, released in 2011, also rises a digit to No. 5 in its 10th week back on the tally with two Dolly covers, one track with Dolly harmony and one track with Trio harmony, while Ronstadt's Original Album Series (also from 2011 and featuring one Dolly cover and one track with Dolly harmony) gains four to No. 15 in its ninth week back on the charts. Sevier County's The Mountain Press over the weekend posted a story on the new production Dollywood's A Christmas Carol and its Dolly hologram. Check it out here. Jane Fonda will receive next year's Lifetime Achievement Award from the American Film Institute in June and plans to have her 9 To 5 co-stars help with her tribute, telling Yahoo: "Dolly and Lily will save me." Read more here. Dolly's "Hard Candy Christmas" slips six spots to No. 44 holiday digital songs in its fifth week this year and 23rd week since release, the Nov. 30 Billboard numbers released Thursday showed. Her and Kenny Rogers's Once Upon A Christmas gains six to No. 7 country catalog albums in its 86th chart week and its third this year, receives a second week this year on the pop catalog albums charts holding steady at No. 42 for an 18th week and re-enters the top 200 pop albums chart at No. 188 to mark its first week this year and its 22nd week since release. Willie Nelson's To All The Girls, featuring a new Dolly duet, in its fifth week loses eight to No. 19 country, 50 to No. 103 pop, 41 to No. 91 current albums and falls off of the Internet sales tally, down from No. 20. Kenny Rogers's You Can't Make Old Friends, also with a new Dolly duet, moves up one in its sixth week to No. 32 country, five to No. 161 current albums and falls back off the top 200 pop albums chart down from No. 186 in its fourth chart week. The Civil War ballad collection Divided & United, with a Dolly duet with Stuart Duncan, dips 10 to No. 32 country in its second week, and falls off the other charts, down from No. 190 pop, No. 158 current albums, No. 23 Internet sales and No. 25 independent labels albums. I Will Always Love You: The Best of Whitney Houston, featuring her cover of Dolly's title song, holds steady at No. 74 in its 53rd week on the R&B/hip-hop albums chart. Overall, Duck Dynasty's Duck The Halls: A Robertson Family Christmas remains steady at No. 1 country and slides one to No. 4 pop in its third week, while Luke Bryan's Crash My Party remains at No. 2 country and loses one to No. 12 pop in its 15th week. Live Nation Australia/New Zealand this week released two more videos from Dolly's Q&A session: her favorite memory of working with Tammy Wynette here and her favorite memory of Australia here. Reuters news service this week profiled the new Dollywood's A Christmas Carol complete with its Dolly hologram. Check out the video report here. Tennessee native poet, activist and educator Nikki Giovanni praises Dolly for her humanity and philanthropy but didn't like Elvis Presley because of his backward racial attitudes, The Tennessean reported here. She said: "Dolly's good people, and she does stand for something . . . She's always a joy. You buy a ticket to a Dolly Parton concert, you get your money's worth. And I think it's wonderful that somebody from Sevierville has helped to change and shape the world." During the one year he served as mayor of Cincinnati, talk show legend Jerry Springer used the position to invite artists to perform in the city and give them the key to the city simply because he wanted to meet them. Among his targets he met through this method: Linda Ronstadt, Willie Nelson, Bob Dylan, The Eagles and Dolly, Contact Music reported here. Drag queen Pandora Boxx talks about how she worked on her Dolly impersonation for Saturday night's tribute show Workin' that will take place Saturday night at San Francisco's legendary Castro Theatre on organizer Peaches Christ's website here. The event's Facebook page is here, get tickets here and read more about it here. Live Nation Australia/New Zealand took questions on its Facebook page for Dolly in advance of her Blue Smoke World Tour, and the first couple were answered this week on its YouTube channel. Check out Dolly's introduction here, the first question here and the second one here. In other tour news, tickets go on sale Friday via Ticketmaster for her two Oklahoma dates at the end of May. Broadway World has a great preview of Dollywood's A Christmas Carol, complete with a scene of Dolly acting and one of her singing plus the cast performing a few other of her songs from the new musical at the park. Watch it here. Kenny Rogers and Dolly are on the cover of the current issue of Country Weekly magazine promoting an interview inside. Check out a note about it on the magazine's website here. Bluegrass singer Donna Ulisse put out a new album last month with a Dolly cover. She did "In The Good Old Days (When Times Were Bad)" on Showin' My Roots. Get your copy here! Dolly has added a second stop in Nevada on her Blue Smoke World Tour: Jan. 26 in Reno at the Reno Events Center. Tickets go on pre-sale via Ticketmaster for LiveNation members and the venue's members at 10 a.m. Thursday before becoming available to the general public at 10 a.m. Friday. This marks the fourth January U.S. stop on the tour before it heads overseas. As has been previously reported, most of the American leg of the tour will take place in May and has yet to be announced. Dollywood will unveil the ride vehicle for its new FireChaser Express coaster at 10:30 a.m. Tuesday via Livestream. Check it out here. The Kenny Rogers and Dolly duet "You Can't Make Old Friends" fell off CMT's Hot 20 Countdown on Saturday, down from one week at No. 19. Vote for it in next week's charts on GAC here and CMT here. Overseas, the 2007 compilation The Very Best Of Dolly Parton, Volume 1 loses five to No. 17 in its 296th week on the top 40 Australian country albums tally while The Essential Dolly Parton dips eight to No. 23 for a 56th chart week. On the British country compilation charts, Emmylou Harris's Original Album Series, Volume 2 (featuring one track with Dolly harmony and two tracks with Trio harmony by Dolly and Linda Ronstadt) rises one to No. 4 in its 10th week on the chart, and her first Original Album Series, Volume 1, released in 2011, gains five to No. 6 in its ninth week back on the tally with two Dolly covers, one track with Dolly harmony and one track with Trio harmony. Ronstadt's Original Album Series (also from 2011 and featuring one Dolly cover and one track with Dolly harmony) re-enters the top 20 at No. 19 in its eighth week back on the charts. The release date for the children's book Who Is Dolly Parton? has been pushed back more than two months. The illustrated biography will now be out April 3 instead of Jan. 23. Dolly has added a third January U.S. date to her Blue Smoke World Tour, fulfilling the promise to play in Nevada. She will perform at the Star of the Desert Arena at the Primm Valley Casino Resort near the California-Nevada border 25 minutes south of Las Vegas on Jan. 25. Tickets will go on sale at noon Nov. 26 via Ticketmaster and the casino box office. Her primary U.S. leg of the tour will take place in May, although only two of those dates are currently known (May 30 and 31 at an Oklahoma casino near the Texas border). She had said she would do just a handful of January dates in the West, specifically covering California, Arizona and Nevada, and now one show has been announced in each of those three states. Coverage of the Nevada date is available from FOX 5 Vegas here. The Kenny Rogers and Dolly duet "You Can't Make Old Friends" regains one place to No. 4 on the Great American Country Top 20 Country Countdown Friday. Vote for it in next week's charts on GAC here and CMT here. Overseas, The Real Dolly Parton three-CD set dips four to No. 43 in its fifth week on the Irish pop albums chart. The Pikes Peak, Colo., area affiliate of Dolly's Imagination Library book program is profiled this week in The Colorado Springs Gazette here. Knoxville's WBIR on Friday reported on the new Dolly hologram in Dollywood's A Christmas Carol, including the first footage I've seen of it in action. Check out the piece here or in the media player above. The Civil War ballad collection Divided & United, featuring a Dolly duet with Stuart Duncan, debuts at No. 32 country, No. 190 pop, No. 158 current albums, No. 23 Internet sales and No. 25 independent labels albums on the Nov. 23 Billboard tallies released Thursday. Dolly's "Hard Candy Christmas" re-enters the 50-position holiday digital songs chart this week at No. 38 for a fourth week this year and 22nd week since release. Her and Kenny Rogers's Once Upon A Christmas rises four to No. 13 country catalog albums in its 85th chart week and its second this year, while the CD re-enters the pop catalog albums charts at No. 42 for a 17th week and its first this year. Willie Nelson's To All The Girls, with a new Dolly duet, in its fourth week dips four to No. 11 country, 28 to No. 53 pop, 25 to No. 50 current albums and one to No. 20 Internet sales. Kenny Rogers's You Can't Make Old Friends, also featuring a new Dolly duet, gains one in its fifth week to No. 31 country, 27 to No. 156 current albums and re-enters the top 200 pop albums chart at No. 186 for a fourth chart week. I Will Always Love You: The Best of Whitney Houston, with the late singer's version of Dolly's title song, gains one to No. 74 in its 52nd week on the R&B/hip-hop albums chart. Overall, Duck Dynasty's Duck The Halls: A Robertson Family Christmas remains steady at No. 1 country and gains one to No. 3 pop with 73,000 copies sold in its second week, while Luke Bryan's Crash My Party moves up two to No. 2 country and one to No. 11 pop in its 14th week. Dolly is featured among the glitz and glamour of the 1970s and 1980s in a new book of images by the late photographer Mario Casilli. Titled Mario Casilli, the tome comes out next Thursday from Reel Art Press and includes an image from Dolly's cover shoot for TV Guide in October 1987 to promote her ABC series, although the featured photo is not the one used for the magazine. Reserve your copy here! Dolly's Imagination Library early childhood literacy project is expanding its presence in Madison County, N.Y., The Utica Observer-Dispatch reports here, and southwest Minnesota, The Murray County News reports here, while the program starts in Greene County, Ohio, The Xenia Gazette reports here. An original cast recording of Dolly Parton's My People show from Dollywood was officially released on Saturday at the start of the park's annual Smoky Mountain Christmas festival. 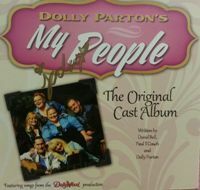 The CD is for sale outside the show's theatre and features the entire cast, including Dolly, performing all of the songs from the production that Dolly, Paul Couch and David Bell put together this season: "My Mountains, My Home," Dialogue/"In The Pines," "Tennessee Mountain Home," Dialogue/"Tip-Toe, Tip-Toe Little Dolly Parton"/"Little Tiny Tassel Top," "Mama"/"Being Dad," "The Dinner Bucket Song," "Coat Of Many Colors," Dialogue/"Dumb Blond," "Applejack," "Family," "Travelin' Family Band," Dialogue/"I Will Always Love You," "Nine To Five," "My Mountains, My Home (reprise)." A Country Christmas Story, the new holiday movie featuring Dolly, premiered Saturday night on Lifetime and included two original Dolly songs as performed by other members of the cast: the previously-announced "Miss You, Miss Me" and also a number called "Fiddlin' Around." Both songs were performed by the finalists in the singing competition hosted by Dolly in the film and were, according to the story, songs the contestants wrote themselves. (The third finalist's song was not written by Dolly.) The New York Daily News reviewed the picture here and The Huffington Post provided its review here. In addition, News OK posted an interview with Dolly that focused mostly on the project here. The movie repeats at 8 p.m. Eastern Friday night and midnight Saturday morning. The Kenny Rogers and Dolly duet "You Can't Make Old Friends" debuted Saturday on CMT's Hot 20 Countdown at No. 19 and on Friday the music video slid one place to No. 5 on the Great American Country Top 20 Country Countdown. Vote for it in next week's charts on GAC here and CMT here. In other chart news, the new compilation collection The Real Dolly Parton holds steady at No. 39 in its fourth week on the Irish pop albums chart. Down Under, the 2007 compilation The Very Best Of Dolly Parton, Volume 1 falls four to No. 12 in its 295th week on the top 40 Australian country albums tally and falls back off the top 50 catalog albums chart, down from No. 49 in its 33rd week there. Also on the country tally, The Essential Dolly Parton gains a dozen digits to No. 15 for a 55th chart week. On the British country compilation charts, Emmylou Harris's Original Album Series, Volume 2 (featuring one track with Dolly harmony and two tracks with Trio harmony by Dolly and Linda Ronstadt) regains one to No. 5 in its ninth week on the chart, and her first Original Album Series, Volume 1, released in 2011, rises four to No. 11 in its eighth week back on the tally with two Dolly covers, one track with Dolly harmony and one track with Trio harmony. Two more Dolly interviews to promote her upcoming Blue Smoke World Tour popped up in recent days. Read one from The Sydney Morning Herald here and one from The New Zealand Herald here. Miley Cyrus is once again calling godmother Dolly her role model, both as an entertainer and as a person who treats others with respect and kindness. She made the comments recently on a German interview program. Learn more from Access Hollywood here. Residents of the Kettering, Ohio, area have until Saturday to catch a local production of Dolly's 9 To 5: The Musical at Playhouse South. And The Fort Wayne Journal Gazette spoke to the actors in that Indiana city's production here. Dolly revealed an additional stop on her Blue Smoke World Tour and an additional track on her Blue Smoke CD in an interview posted Thursday by The Fort Worth Star Telegram. The concert location is WinStar World Casino in Thackerville, Okla., about 75 miles from Fort Worth. She'll play the casino for two nights: May 30 and 31, the first announced dates for the May U.S. leg of her tour. She also disclosed that her Willie Nelson duet on "From Here To The Moon And Back" (released a few weeks ago on his duets album To All The Girls) will appear on the album, bringing the total number of known tracks to eight, adding it to "Blue Smoke," "I Dreamed About Elvis," a re-recording of "Early Morning Breeze," "Miss You, Miss Me" a bluegrass cover of Bob Dylan's "Don't Think Twice, It's All Right," a gospel cover of Bon Jovi's "Lay Your Hands On Me" and the Kenny Rogers duet "You Can't Make Old Friends" that appeared on his recent CD You Can't Make Old Friends. Read the interview (which includes a shout-out to "the exhaustive Dollymania.net") here. The holiday season is officially upon us. Kenny Rogers and Dolly's 1984 Christmas album Once Upon A Christmas has made its annual chart debut. The CD comes in at No. 17 on the weekly country catalog albums tally for Nov. 16, Thursday's Billboard numbers revealed. The album has peaked at No. 1 on the chart several years ago and this marks its 84th chart week on the list. Elsewhere, Dolly's "Hard Candy Christmas," which has appeared on all re-issues of the album since Rogers left RCA and took his solo recordings with him in the late 1980s, this week falls off the 50-position holiday digital songs chart, down from No. 37 in its third week on the list this year and its 21st week since inception. Willie Nelson's To All The Girls, featuring a new Dolly duet, in its third week loses three to No. 7 country, six spots to No. 25 pop and No. 25 current albums and a dozen digits to No. 19 Internet sales. Kenny Rogers's You Can't Make Old Friends, also with a new Dolly duet, drops 10 places in its fourth week to No. 32 country, 57 spots to No. 183 current albums and falls off the top 200 pop albums chart, down from No. 136. I Will Always Love You: The Best of Whitney Houston, featuring her cover of Dolly's title song, holds steady at No. 75 in its 51st week on the R&B/hip-hop albums chart. Overall, Duck Dynasty's Duck The Halls: A Robertson Family Christmas debuts at No. 1 country, No. 4 pop with 69,000 copies sold, while Thomas Rhett's It Goes Like This debuts at No. 2 country, No. 6 pop with 36,000 units moved. Dolly wasn't on the Country Music Association Awards Wednesday night, but that didn't mean she wasn't mentioned. Brad Paisley did an air bag breast joke about her recent fender-bender, making USA Today here. And Kenny Rogers accepted a lifetime achievement award and performed "Islands In The Stream" with Sugarland front woman Jennifer Nettles, garnering a mention from Yahoo's music blog that she wasn't Dolly here. '9 To 5' Heading To Fort Wayne, Ind. Dolly's 9 To 5: The Musical is coming to the Fort Wayne Civic Theatre in Indiana. Check out the story from The Fort Wayne News Sentinel here. Guests are just days away from the debut of Dolly's hologram in the brand new Dollywood's A Christmas Carol, opening Saturday at Dolly's Tennessee theme park to kick off its Smoky Mountain Christmas festival. Four million twinkling lights, additional holiday entertainment shows, a miniature railroad and themed food offerings complete the festival, which runs through Jan. 4. The new show features holograms of Jacob Marley, the Ghost of Christmas Present, the Ghost of Christmas Future and Dolly as the Ghost of Christmas Past, marking the first time ever that four holographic actors have appeared in the same theatrical production. The 45-minute re-telling of the classic Charles Dickens tale also includes eight new songs composed by Dolly and featuring classic Scots-Irish rhythms and musical structures based on traditional English folk songs in recognition of maintaining its original setting in Victorian England. In a press release, Dolly said: "When they told me they were going to make a hologram out of me, I thought they were crazy. But when I saw how real it looked on stage, I couldn't believe it. I'm not sure this world can handle two Dolly Partons, but I'm excited folks will be able to see 'the other Dolly' reminding families that it's not what you have but who you have, just like ole Scrooge figures out in the end." 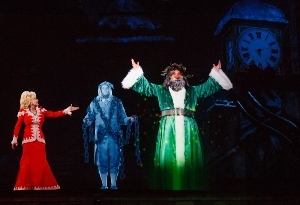 Shown in a publicity image at left is Dolly's Ghost of Christmas Past hologram gesturing to the Ghost of Christmas Present hologram during the show's curtain call. Click on it for a larger view. Another overseas interview promoting Dolly's Blue Smoke World Tour popped up this week, this time with Scotland's Daily Record. It includes the tid-bit that she'd like to take a peek up Sean Connery's kilt. Read more here. Dolly is the nation's best-known country music star, according to Repucom's Celebrity Davie Brown Index. The weekly survey of 1,000 Americans ages 13 to 75 finds Dolly is recognized by 95 percent of respondents, with Taylor Swift in second place at 92 percent, The Los Angeles Times reports here. Lifetime continues to promote Dolly's holiday film, A Country Christmas Story, which premieres on the network Saturday night. This week, they posted a Q&A with her about the holidays. Read it here. The Lane Twins' fan documentary Hollywood To Dollywood has been added to the line-up for LGBT cable television network Here TV, it was announced this week. It is among 30 films to join the channel's roster thanks to a licensing deal with Breaking Glass Pictures. The Lifetime cable network on Monday released a preview video for A Country Christmas Story, this weekend's holiday film featuring Dolly. Watch it in the media player above or by clicking here. The movie premieres at 8 p.m. Eastern Saturday. The Phoenix New Times on Monday released a story based on a brief Dolly interview with the publication to promote her upcoming concert in the city. Read it here. Two Dolly products make their way to store shelves on Tuesday. Divided & United , the country music compilation consisting of new versions of Civil War-era songs, which includes a Dolly duet with Stuart Duncan on the track "Listen To The Mockingbird," is released Tuesday. Get your copy here. Also, the paperback edition of last year's Dream More: Celebrate The Dreamer In You also comes out Tuesday. Get that here! There are not really any details available right now, but I'm told fans should be on the look-out sometime in the near future for word of the first-ever Porter & Dolly boxed set. More news as it becomes available. Also, I hear a new Dollywood CD will be revealed shortly as well! Continued coverage Down Under of Dolly's Blue Smoke World Tour kept her 2007 compilation The Very Best Of Dolly Parton, Volume 1 back in the top 10 for a second week in a row, although the title slips one digit to No. 8 in its 294th week on the top 40 Australian country albums tally. It slides 19 to No. 49 on the top 50 catalog albums chart to mark a 33rd week there. Also on the country side, The Essential Dolly Parton re-enters the top 40 country list at No. 27 for a 54th chart week. On the British country compilation charts, Emmylou Harris's Original Album Series, Volume 2 (featuring one track with Dolly harmony and two tracks with Trio harmony by Dolly and Linda Ronstadt) loses one to No. 6 in its eighth week on the chart, and her first Original Album Series, Volume 1, released in 2011, holds steady at No. 15 in its seventh week back on the tally with two Dolly covers, one track with Dolly harmony and one track with Trio harmony. Ronstadt's Original Album Series (also from 2011 and featuring one Dolly cover and one track with Dolly harmony) falls out of the top 20, down from No. 13 in its seventh week back on the charts. Dolly's tour coverage overseas continues. Thanks to Christopher Lillis for alerting me to his posting of several Irish interviews on YouTube here, here and here. Also, U.K. fan site operator Joe Skelly of Dolly Part'ners was interviewed by In Cumbria about his plans to see 15 of her concerts on the European leg of the tour. Read it here. Don't forget Dolly's new Lifetime holiday film A Country Christmas Story premieres on the cable network Saturday night at 8 p.m. Eastern. The channel has added a page about the project to its website here which notes it will repeat at midnight Sunday morning, 8 p.m. Friday Nov. 15 and midnight Saturday Nov. 16. Juneau, Alaska, will celebrate distributing its 100,000th book from Dolly's Imagination Library early childhood literacy program Friday, The Juneau Empire reports here. Dolly this week is the top ticket-seller in the U.K., according to ticket information tracked by Stereoboard, a British site that compares ticket prices for fans. She takes the No. 1 spot this week on its Hot Ticket Chart here. In other news, stories and clips from her day of interviews this week continued to make the rounds, with one from The Project in Australia hitting YouTube here and an interview focusing on goddaughter Miley in The London Evening Standard here. The Irish Independent opined here why "we'll always love Dolly," and The Arizona Republic noted her upcoming January show in Phoenix here. Finally, I'm told that in an appearance on The John Murray Show on Ireland's RTE1, she confirmed her Kenny Rogers duet "You Can't Make Old Friends" will appear on Blue Smoke (making it the seventh song from the track listing to be announced). She was also asked about a visit to a pub of a nationally well-known personality, Paudie O'Shea, while in the country on vacation a few years back, and she remembered many details of the visit. (O'Shea passed away about a year ago, and a video of the stop at the pub is available here.) Thanks, Katyb! The Kenny Rogers and Dolly duet "You Can't Make Old Friends" slips one spot to No. 4 this week on the Great American Country Top 20 Country Countdown, down from its peak at No. 3. Vote for it in next week's charts on GAC here and CMT here. In other chart news, the three-CD compilation The Real Dolly Parton slides six places to No. 39 in its third week on the Irish pop albums chart. There were a few "Dollys" out and about for Halloween. Katie Couric attended Bette Midler's holiday gathering a la Dolly. Check it out from The Daily Mail here. And husband and wife Eddie Cibrian and LeAnn Rimes went the duo route and donned Kenny & Dolly costumes. See those in US magazine here. The second of Dolly's handful of January dates out west was revealed on Thursday. She will play the Comerica Theatre in Phoenix, Ariz., on Jan. 28. Tickets are scheduled to go on sale via Live Nation on Friday, Nov. 8. In related news, she was interviewed via satellite by Ireland's The Magazine for an episode airing Friday night on UTV, the network noted here, and some comments from her interview on Radio One made The Irish Independent here. Finally, Access Hollywood included some information from her interview on that program that aired on Thursday here. Dolly's "Hard Candy Christmas" holds steady on the digital holiday songs chart this week at No. 37 to log its 21st week on the tally and its third week this year, the Nov. 9 Billboard charts out on Thursday showed. Willie Nelson's To All The Girls, with a Dolly duet, in its second week drops two to No. 4 country, 10 places to No. 19 pop and No. 19 current albums, two to No. 7 Internet sales and off the 25-position digital albums sales list, down from No. 23. Kenny Rogers's You Can't Make Old Friends, also featuring a new Dolly duet, loses seven spots in its third week to No. 22 country, 61 digits to No. 136 pop and 51 spaces to No. 126 current albums. I Will Always Love You: The Best of Whitney Houston, with the late singer's version of Dolly's title song, falls two to No. 75 in its 50th week on the R&B/hip-hop albums chart. Overall, Luke Bryan's Crash My Party rises two to No. 1 country and gains two to No. 10 pop with 25,000 copies sold in its 12th week, while See You Tonight from Scotty McCreery slips one to No. 2 country and nine to No. 15 pop in its second week.